Luckily for us, our feisty local tabloid has dug deep and unearthed the real villains in the Boston Marathon bombings. Deval Patrick and the Massachusetts welfare system. Then it really picks up steam on pages 4 and 5. So that’s five – count ’em, five – reporters on this story, plus his ‘n’ her bookend columns by Howie Carr and Margery Eagan. It’s time for all the bureaucrats, paper-shufflers and flak-catchers to come clean on the Tsarnaev clan, those chiseling Chechens who tried to kill us last week. Open the damn books! If somebody tries to murder you, you have a right to know everything about them, privacy be damned. I want to know everything about them, and I want to know it now, right down to the quality of the weed Dzhokhar was peddling down at UMass Dartmouth. Here’s what we’re talking about: One accused mass murderer who’s practically confessed to killing three marathon bystanders, plus a police officer, and injuring 260 others. And his brother, killed after a gunfight in which yet another police officer nearly died. 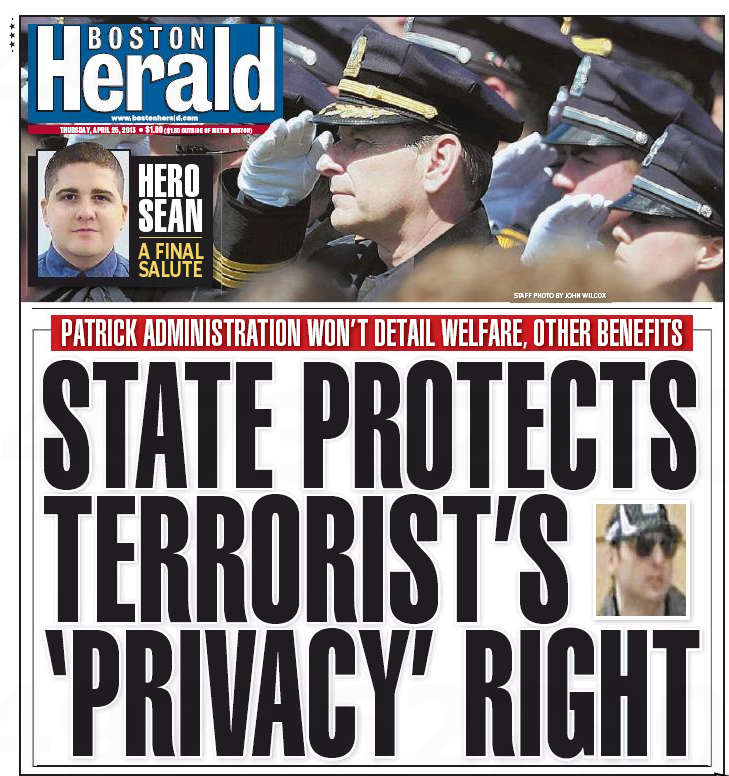 Yet the state and federal government bureaucrats are telling you, me and every taxpayer who mailed their tax checks on the very day of the marathon bombings that Tamerlan and Dzhokhar Tsarnaev’s privacy matters more than our right to know how extensively our tax dollars may have contributed to their terrorist plot. The Tsarnaev brothers lived in America long enough to understand the generosity of her people. In fact they should have understood that generosity better than most given that they benefited from it personally — and in the form of actual taxpayer cash. 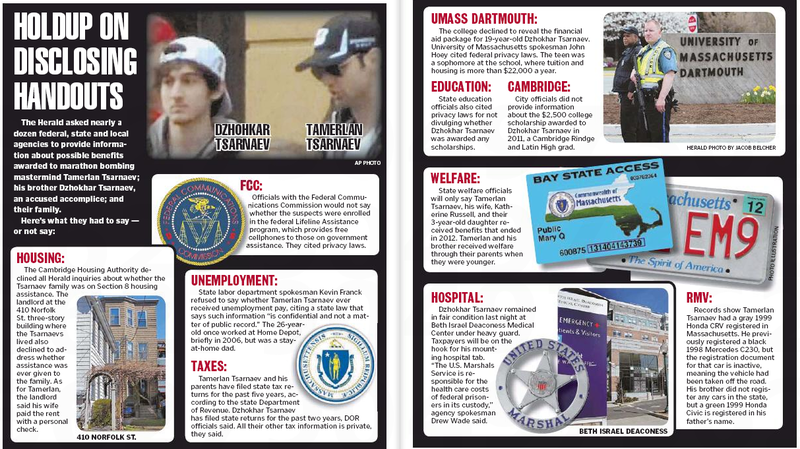 We learned this week that Tamerlan Tsarnaev, the apparent mastermind of the Boston Marathon bombing, was until recently supporting his family with the help of a government check. Crosstown at the Boston Globe, meanwhile, the welfare issue isn’t even on their radar screen. The only question left: Which of the two is Bizarro World? This entry was posted on Thursday, April 25th, 2013 at 9:18 pm and is filed under Uncategorized. You can follow any responses to this entry through the RSS 2.0 feed. You can leave a response, or trackback from your own site. 4 Responses to Hack Attack by Boston Herald!! You have a lot of company, Carly.